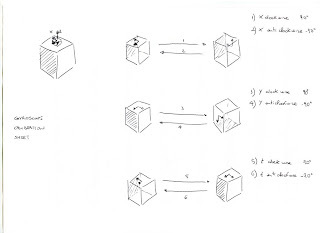 can you give me your reference for this method? because I want calibrate mpu6050 for my master's thesis and I need to reference. ok, send me an email. please send me your reference. Could you send me the reference too? I'm going to build a Lego Mindstrom robot using MPU6050. could you send me too ? you can find it googling for : "gyroscope calibration by integration"
hi, Davide, I send you an E-Mail. Have you seen it? Please send me also the references for mpu6050 calibration Sir. you can find references googling for : "gyroscope calibration by integration"
can you share code read and calibration mpu6050. i can't calibration mpu6050 with avr ! Hello, you find it in the "Code" paragraph above. Thank for suppot. But don't understand , we will user code "avr_lib_mpu6050_03.zip" and use "#define MPU6050_GETATTITUDE 2" for calibration mpu6050 ? And now "#define MPU6050_CALIBRATEDACCGYRO" 1 or 0? And question i can't run gyro_docalibration.py, you can share library python(all modun) use on project. To run the python code, you have to install python to your system. This one uses python 2.7.*. Firmware side, you have to add the snippet avrgcc provided above in your project main function. You can also use your own mpu6050 library. This works even with mine mpu6050 library, but you have to insert the snippet for sending raw values to the calibration script. Obviouslly, you have to change the raw readin function (read_x_axis_raw_data.. etc..) according to your library. and MPU6050_AXGAIN, MPU6050_AYGAIN, MPU6050_AZGAIN ? Hello, the scale factor should be your gain. Anyway your values seams a little out of range to me. follow you. I think calibration gyro, accel unresolved issues thoroughly. you can just me way fixed? Drift problem is a common problem in gyro. That's the reason why a gyroscope has to be calibrated. Accellermeter calibration is not for drift error fixing, but it helps. Once you have calibrated, recompile project with calibration enabled, because the method for uncalibrated and calibrated estimation changed. Take a look at your code to understaind where the calibration values comes in play. Also check your hardware and gyroscope with other firmware, to be sure that your hardware works in the correct way. Sorry for the delay, "stylusc84" let me think about this calibration method again, and about the value you ("angels demons") obtained. Please take a look at the below comment (July 15, 2014 at 1:27 PM to me). Hope this helps, Davide. 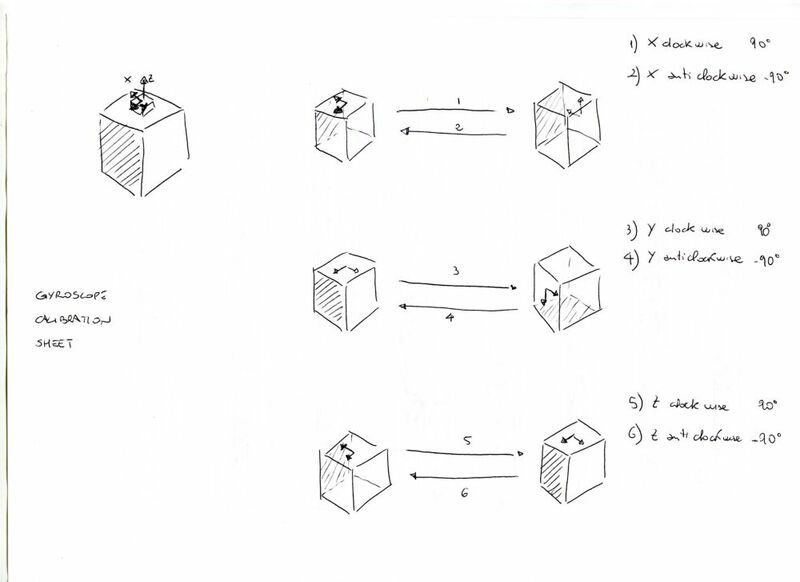 Hi Davide, A question, in the video, what is it the reference of the Gyro of the calibration? It is the MPU6050? Hello, no is a ITG-3200 mounted on a 10dof imu. But i've calibrated some mpu6050 with this method without problems. Thank you for your answer, i just figured it out - you were right. The problem was because i didn't turned on the receive complete interrupt bit. Now i have done the gyro calibration but the results are strange - i have the same problem as 'angels demons' who commented above, The scale factor is to small. Here you can see my results: http://imgur.com/FV7kq4G Do you have any ide what can be the cause of that? I have not noticed that the gain in my mpu6050 library is expressed as LSB/(°/s), because the library conversion use gyroscope gain as divisor value. What you get from this calibration is 1/LSB. So to obtain your mpu6050 gain, useable with my library conversion, you have to divide 1 by the scale factor obtained. In other words: you obtain 0.0633, the scale factor for my mpu6050 library will be 1/0.0633 = 15.797, which is pretty reasonable value considere the 14.6 uncalibrated value. Let me know it this works. how to calibrate mobile phone's gyroscope? You can use the alghorim that i use here, but you have to customize the code. 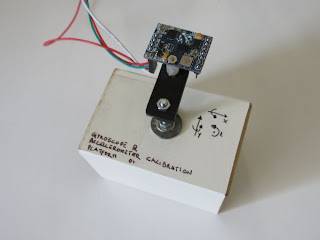 How to calibrate mobile device's accelerometer , can you help me in writing matlab code for the same, because i travelled 11 metres, it gives 5000 metres. Even for an accelerometer you can use the standard calibration method. There is not a lot of math in accel basic calibration, so, if you want you could also use simple programming languages, and omit the use of matlab. If you google around you can find a few tutorial. Here you can find my accellerometer calibration method: http://davidegironi.blogspot.it/2013/01/accellerometer-calibration-helper-01.html that can easly be traslated on mobile device. Anyway, your error is so big that it makes me think you are making something wrong in distance computation alghoritm, and not in calibration. I am using double integration to find the displacement. I have tried both cumtrapz(trapezoidal) of matlab and also euler method. i have used kalman filtering, least square methods for calibration. after using your method of calibration , i moved 11 metres and result shows i am in different country, feeling frustrated, am not getting any good results after so much effort in calibration. Here, in this post, i'm talking about gyroscope calibration. What you are talking about accelerometer calibration, and the way this influence the measure the displacement of an object. So we are pretty distant from what is this post on. You should not filter using kalman filtering before the calibration, calibration should be done on raw values, math speaking, the offset could be even done of yet converted to g-force values, but it is better done on raw for floating math embedded reasons, instead the gain factor, has to be calibrated on raw accelerometer values, cause it deserve to convert raw to g-force values. Look at an accelerometer datasheet to understaid this. Note that double integration is not the best method for doing displacement approximation, cause you are computing even the noise in the data, so, you could add some sort of high pass filter (IIR for example), between the integration process, but a better method should be to work on frequency domain, so basically: take FFT of accell data, convert the data to displacement by dividing each element by -freq^2, then that the inverse FFT back to time domain. Ya, david i could have posted the comments on your acccelerometer page, but initially i have started here, that's the only reason to post comments on accelerometer at this page. Phone gives accelerometer along x, y and z axis. (are these values not raw values?). kalman filtering can't be used for calibration?? and i am very thankful for your answers. Generally speking, calibration is to obtain better results. The lower results level, is the raw data coming out from the accelerometer board. Because you have to calibrate the board, it has to be done at the lower level possible, the raw values. Also, if you filter the values, then you apply calibration on "not-pure" value. Try to get at first better result from the lower data coming out, then you can apply filter to improve results. % 2. Take the Fourier transform (FFT) of the accel. data. % 3. Convert the transformed accel. data to displacement data by dividing each element by -omega^2, where omega is the frequency band. % 4. Now take the inverse FFT to get back to the time-domain and scale your result. %plot(abs(f)) % Acceleration data in frequency domain before filtering. % Filtering the noise in frequencies higher than 10 Hz. still i do not get the right results. is my code correct? the link you give us is also giving -ve values for the displacement. You have to debug your matlab arrays. I can not do this homework for you, it would be useless for you. What i can do, is help you, but not doing this for you. First: check that your accelerometer return good values, the attitude estimatiton is simpler than displacement, so check you accelerometer at first with attitude estimation. Then, record your accelerometer values on one plane, just move it by 50cm. Check displacement alghoritm with that recorded values. In simple words: start it simple, do it at small steps. i have just moved 11 metres. david i am using mobile phone's sensors. i am using android app to get the accelerometer values. david are you sure the link you give is correct, today i have presentation on calibration and displacemnt from accelerometer data. plz reply soon.. Please, do not flood with comment! This unusefull! should i post these questions on accelerometer page?? No, now post here, but Be concise! I'm just trying to maintain order in my blogpost, please, do not flood with many comments. Just write one !Concise!, possibly without code, use external link for code. Immagine a people looking at your comments, he can not read many comments for just one question. ya, you are right. The link you give also gives -ve values for the displacement. it does not gives the actual displacement. I deleted the two comments above here, cause are unusefull. Because i see you do not understaind what i'm try to telling you, for further comment, please write to my email address. If i have time i will for sure reply you. simplebgc help olurmusunuz PID control and engine settings. How do I do this settings. Can not understaind what you are asking. Anyway, this is not a PID controller, this is a calibration routine for gyroscope. You have got a mail with attached a l3g4200d sample project, compiled for ATmega8 @ 1Mhz, code also provided. Hope this helps. I am trying to calibrate my MPU-6050. The main code is based on your code which is excellent and easy readable. I'm using the MPU-6050 with the DMP. I'm trying to avoid the yaw drift as much possible can be done. I downloaded Python 2.7.13 and the script shows error on "import serial" command line12. Hello and thank you. This script was written and tested on Python 2.7, so that version should work. But you have to install some modules, like the serial one. On ubuntu it will be something like sudo pip install pyserial. Finally I installed the appropriate modules and the script runs well. On the avr side according to your snippet I wrote a function that is collecting the raw data and send them to the script. Now, as I said on my previous post I am using the DMP but I don't understand where in code the offset and gain comes in play. In the MPU6050_dmpInitialize function you mentioned three variables (xgOffset - ygOffset - zgOffset) and you have given a value only to zgoffset variable*. From the other side the MPU6050_CALIBRATEDACCGYRO comes in play only when the MPU_GETATTITUDE is 0 or 1. * I don't know if those variables have any contact with calibration. Happy to hear that. You can try setting it using the mpu6050_setZGyroOffset function. It's a few that i do not look at that libray, so I may be wrong. If so, you can take a look to the i2cdevlib forum about that sensor.